23/01/15 -- Soycomplex: Beans closed lower on the day and lower for the third week in a row. Weekly export sales of only 14,100 MT for 2014/15 were a marketing-year low, down 99 percent from the previous week and 98 percent below the prior 4-week average. There were cancellations from unknown destinations (413,800 MT) and China (77,000 MT). There were also net sales of 101,200 MT for 2015/16 shipment. Actual exports themselves of 1,631,800 MT were still pretty robust though. The US has now exported 33 MMT of soybeans already this year, and has another 11.3 MMT of outstanding sales. That takes total commitments for 2014/15 to 44.3 MMT, which is 92% of the USDA target for the season, versus 78% normally at this time. The Argentine Ag Ministry trimmed their forecast for soybean plantings there this year to 20 million hectares, down 0.2 million from previously, but up from 19.78 million a year ago. They said that the crop is now 95% planted versus 92% this time last year. Crop conditions are said to be good. The Buenos Aires Grain Exchange estimated Argentine plantings a little higher at 20.4 million hectares, of which 98% is already sown, according to them. Brazilian analysts Agroconsult forecast the soybean crop there at 93.9 MMT, which is down slightly on their previous estimate and 1.6 MMT below the USDA, although still a record. Mar 15 Soybeans closed at $9.72 3/4, down 4 cents; May 15 Soybeans closed at $9.79 1/2, down 3 1/2 cents; Mar 15 Soybean Meal closed at $331.50, up $1.40; Mar 15 Soybean Oil closed at 31.60, down 37 points. For the week that puts nearby beans down 19 cents, with meal up $5.30 and oil 179 points lower. 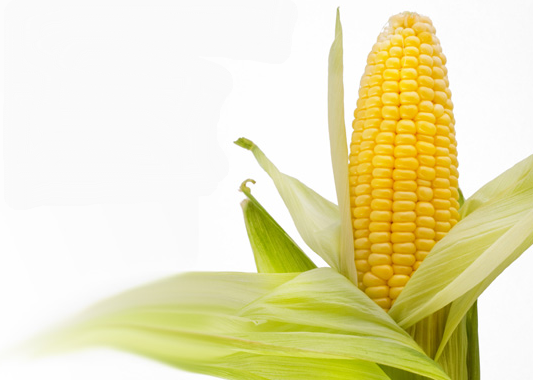 Corn: The corn market closed higher on the day, but virtually unchanged on the week. Weekly export sales of a very impressive 2,185,400 MT for 2014/15 were a marketing-year high and up noticeably from the previous week and from the prior 4-week average. Actual shipments of 762,400 MT were also much better than a week ago, and up 31 percent from the prior 4-week average. Shipments for the season so far are 13.8 MMT, along with another 16.6 MMT of outstanding sales. That puts total sales commitments so far this season at 68% of the USDA target for 2014/15 versus 59% typically at this time. That's quite impressive given the recent strength of the US dollar. Sorghum sales were large again at 307,700 MT for 2014/15, and were mostly for China (209,500 MT) and unknown destinations (86,100 MT). Total sorghum sales commitments for the season are now already 96% of the USDA target for all of 2014/15. The Argentine Ag Ministry forecast all corn plantings there at 5.4 million hectares, down from 5.5 million previously. The Buenos Aires Grain Exchange estimate corn for grain plantings at 3 million hectares, and said that sowing is 91.6% complete, which is up only 3.8 percentage points on a week ago. China's December corn imports were only 607 TMT, down 26% versus a year previously. Their total 2014 calendar year corn imports were 2.6 MMT, a 20% decline versus 2013. Agroconsult estimated Brazil's corn crop this year at 80 MMT, consisting of 30 MMT of full season corn and 50 MMT of "safrinha" or second crop corn. Brazilian growers could do with a timely 2014/15 soybean harvest to get all that second crop corn planted. Will thy get it? Some buyers may see the escalating violence in Ukraine as a reason to shy away from committing to too much of their corn for the time being. Mar 15 Corn closed at $3.86 3/4, up 3 cents; May 15 Corn closed at $3.95 1/4, up 3 1/4 cents. For the week front month corn was a quarter of a cent lower. Wheat: The wheat market closed lower in Kansas and Chicago, and a tad higher in Minneapolis, although all three were lower for the week. Weekly export sales of 458,400 MT for delivery in the 2014/15 marketing year were up 61 percent from the previous week and 69 percent from the prior 4-week average. These were at the top end of albeit modest trade expectations and the best since mid-November. Total net sales are now 77% of the USDA target for the season versus 75.8% typically at this time. More weekly sales like this would be nice, but can the US get them with the dollar at new 11 year highs versus the euro? There were also net sales of 106,000 MT for 2015/16. The Argentine Ag Ministry raised their forecast for this season's wheat crop there from 13.2 MMT to 13.9 MMT, an increase of 51% on a year ago, aided by a 44% jump in planted area. The harvest there is now complete. There's talk of dryness issues for US winter wheat areas. "Heavy soaking rain is needed now in hard red winter wheat. The subsoil is very dry in Kansas, Oklahoma and the Texas panhandle, all key wheat areas, from 3 straight months of drought," said Martell Crop Projections. Meanwhile "tensions continue to rise in Ukraine as the Russians step up their game. The benefits to the EU export market, resulting from the Black Sea backing away from the export market, are being complemented by continued weakness in the Euro," said Benson Quinn. They also noted that Russian analysts IKAR estimate the 2015 Russian grain crop at only 86 MMT versus 104 MMT in 2014, including 50 MMT of wheat against 59 MMT last year. "This seems like an aggressive cut at this point in the game," was their take on that. We shall see. Mar 15 CBOT Wheat closed at $5.30, down 3 3/4 cents; Mar 15 KCBT Wheat closed at $5.64, down 3/4 cent; Mar 15 MGEX Wheat closed at $5.76, up 1/2 cent. For the week Chicago wheat was down 2 3/4 cents, with Kansas 13 cents lower and Minneapolis lost 8 1/2 cents. 23/01/15 -- EU grains closed mixed, with the Paris markets mostly higher on acute euro weakness, and London wheat falling in an attempt to make our exports more competitive with those on the continent. At the close, Jan 15 London wheat was went off the board GBP0.45/tonne lower at GBP126.30/tonne, Mar 15 Paris wheat was EUR0.50/tonne higher at EUR198.50/tonne, Mar 15 Paris corn was EUR1.00/tonne firmer at EUR159.25/tonne and Feb 15 Paris rapeseed was u EUR1.25/tonne at EUR356.50/tonne. For the week overall there was very little movement, London wheat was unchanged, whilst the Paris market rose one euro. Corn was down a quarter and rapeseed fell half a euro. The market is still largely ignoring what is going on in Russia and Ukraine, both militarily and crop-wise. The big story of the week that has grabbed everyone's attention has to be the ECB move to pump more than EUR1 trillion into the eurozone economy which sent the euro tumbling to an 11 year low against the US dollar and a new 7 year low versus the pound. The latter meanwhile fell below 1.50 against the US currency today, a level not seen since July 2013. Despite previous denials, the Russian Deputy PM has apparently now admitted that the recent tough stance on phytosanitary rules was a deliberate attempt to limit grain exports in January, before the new export duty comes in on Feb 1. These rules will be relaxed after that date for the purposes of "transparency in the market" he said! That's Russian politics for you. He said that Russia will export around 28 MMT of grains this season, which is some 6 MMT more than they have currently shipped, according to his figures. The last numbers released from the Russian Ag Ministry said that the country had exported 21.571 MMT of grains to Jan 15. The USDA currently have Russia down to export 27.3 MMT of wheat, corn and barley in 2014/15. Europe will be the most likely beneficiary of any shortfall in Russian exports, particularly given the recent demise of the euro. Brussels said that they'd issued 728 TMT of soft wheat export licences this past week, up 32% on the previous week. That takes the marketing year to date total so far to just over 16 MMT, which is 4% less than last year's record pace. Europe has also exported 531 TMT of durum wheat so far this season, putting all wheat exports at almost 16.6 MMT, which is 55% of the USDA's 30 MMT target for the season. Brussels also granted 286 TMT worth of barley export licences, taking the season so far total to 4.77 MMT, which is in line with a year ago. Cumulative corn import licences are down 23% versus last year at 5.14 MMT. Ukraine's Food Minister denied that the country has any plans to limit grain exports, despite it being widely reported recently that a cap on milling wheat sales had recently been agreed with the country's exporters. Ukraine politics clearly isn't much different to that in Russia. Looking ahead to 2015 production prospects, Russia's Institute for Agricultural Market Studies (IKAR) were said to have estimated the country's grain production potential this year at only 86 MMT, a sharp 17.3% fall on output this season. Wheat will account for 50 MMT of that total, a 15.3% fall compared to this season, they said. 22/01/15 -- Soycomplex: Beans closed around 5-7 cents lower. The US dollar rose to new highs following the news that the ECB was to pump EUR60 billion a month into the eurozone economy. The euro fell to its lowest level against the US dollar since September 2003 on the news. The spectre of this weekend's looming Greek elections is also putting the single currency under pressure. Europe are of course the world's second largest soybean buyer after China. The IGC raised their forecast for the world 2014/15 soybean crop by 4 MMT to a new record 312 MMT, a 10% rise year on year. Consumption was increased 3 MMT and ending sticks raised 2 MMT. "Output in South America is on track to surpass all records," they said. They raised their outlook on Brazil to 94 MMT and increased Argentina to 54 MMT. China's imports were increased to a record 74 MMT. Trade estimates for tomorrow's one day delayed weekly export sales report for beans are around 500-700 TMT. "Sales should really start to slow over the next couple week’s as China gets quiet ahead of Lunar New Year holidays and then demand switches to South America," said Benson Quinn. Mar 15 Soybeans closed at $9.76 3/4, down 6 3/4 cents; May 15 Soybeans closed at $9.83, down 6 1/2 cents; Mar 15 Soybean Meal closed at $330.10, down $0.40; Mar 15 Soybean Oil closed at 31.97, down 44 points. Corn: The corn market closed around 3-4 cents lower. Falling wheat and soybeans, plus the perennially firm US dollar didn't help corn's cause today. The IGC added 10 MMT to the global corn crop in 2014/15, but also raised consumption by a similar amount. World ending stocks were cut 1 MMT to 194 MMT, which is still 5 MMT above the USDA's latest estimate though. There were "bigger than previously forecast crops in Argentina, Brazil, the EU and Ukraine, but a reduced figure for the US," they said. The EU was also seen importing 1.5 MMT more corn in 2014/15 than projected a month ago. The IGC's estimate for the 2014/15 Ukraine corn crop is now 28.5 MMT, which is the same as the Ukraine Ag Ministry. They see Ukraine's 2014/15 corn exports at 18 MMT, up 0.5 MMT from their previous estimate, although less than the 20.2 MMT predicted by the Ag Ministry. The US Energy Dept reported weekly ethanol production up slightly (1,000 barrels/day) to 979,000 bpd. Trade estimates for tomorrow's weekly export sales report for corn are in the region of 600-800 TMT. Mar 15 Corn closed at $3.83 3/4, down 4 1/4 cents; May 15 Corn closed at $3.92, down 3 3/4 cents. Wheat: The wheat market closed lower across the three exchanges, reversing earlier action. This may have been linked to the US dollar surging to fresh highs following the ECB announcement. Constant dollar strength has been a real thorn in the side of US export hopes of late. Early strength had been tied to increased military activity in Ukraine, and another upsurge in tensions between Russia and the West. The IGC were unchanged on their estimate for the global wheat crop in 2014/15 at 717 MMT, but trimmed 4 MMT off consumption to 708 MMT. Ending stocks were increased by 3 MMT to 196 MMT, similar to the USDA's latest estimate. 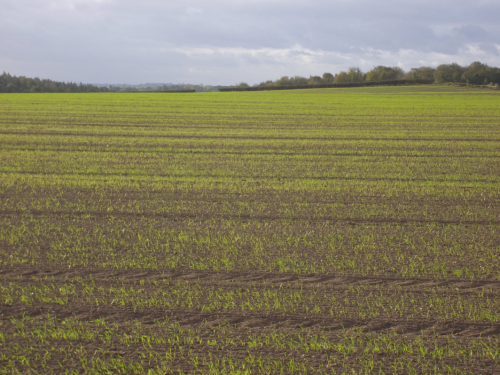 "Prospects for 2015/16 winter wheat remain mostly favourable in the northern hemisphere. "Crops in the US and Russia suffered from adversely cold weather at times, while conditions have been mostly favourable in the EU, India and Turkey," they said. Russia's 2014/15 wheat exports were cut from 22.7 MMT to 18.5 MMT, with Europe's increased from 30.1 MMT to 31.5 MMT. Despite a cut of 0.8 MMT to production in Ukraine, exports were raised 1.2 MMT to 11.5 MMT. Trade estimates for tomorrow's weekly export sales are modest at around 250-400 TMT. Mar 15 CBOT Wheat closed at $5.33 3/4, down 3 cents; Mar 15 KCBT Wheat closed at $5.64 3/4, down 7 1/2 cents; Mar 15 MGEX Wheat closed at $5.75 1/2, down 5 1/2 cents. 22/01/15 -- EU grains traded mixed, but mostly a little higher, as they are starting to develop a sideways look to them. Front month Paris wheat hasn't closed outside the EUR190-200/tonne range so far this year, whilst Jan 15 London wheat has been stuck in the GBP125-135/tonne for the same period. Paris corn seems content to trade in the range of EUR155-165/tonne and Paris rapeseed hasn't been outside the EUR354-364/tonne area since the opening day of the year. At the close Jan 15 London wheat was down GBP0.05/tonne at GBP126.75/tonne, Mar 15 Paris wheat was EUR0.25/tonne higher at EUR198.00/tonne, Mar 15 Paris corn was EUR1.25/tonne higher at EUR158.25/tonne and Feb 15 Paris rapeseed was up EUR0.25/tonne to EUR355.25/tonne. Something surely has to give, but what? For the bulls, Russia and Ukraine surely hold the key? Russia now has more than 9,000 soldiers and 500 tanks, heavy artillery and armoured personnel carriers in eastern Ukraine, the latter's President says, according to a report on the BBC today. A report on Reuters meanwhile yesterday suggested that Russia's President Putin will settle for the autonomy from Kiev, but within Ukraine's borders, of the rebel-held Donetsk and Luhansk regions - but nothing less. Relations between Russia and the West are getting sensitive again. That won't help the Russian rouble, or the country's inflation rate - now running at 11.9%, up from 11.4% at the end of 2014, and moving rapidly higher. Food inflation is already said to be at 16%. This is one of the main reasons that Russian farmers are content to sit on what remaining grain stocks they have, rather than sell them to the government's intervention programme - this is the nearest thing they've got to dollars right now. 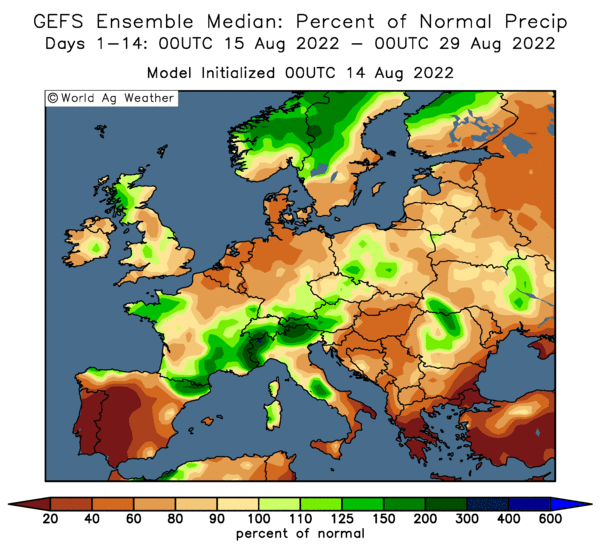 On top of that, crop prospects for 2015 in some parts aren't looking good at all due to "extreme temperatures and lack of snow early in the winter". 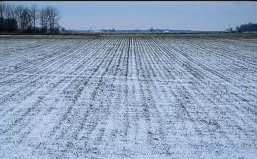 In the Volgograd region, of the 1.3 million hectares of winter grains that have been planted, only 18% are said to be in good condition, with 42% classed as "satisfactory" and 40% in a "poor" state. Russian growers' ability to be able to fund a spring replanting and inputs purchasing programme must be called into question given their lack of access to credit and rapidly rising inflation, combined with the hefty decline in value of the rouble. Back in Ukraine again, the President of their Agrarian Union said that the cost of sowing spring crops there in 2015 would be around 40-50% up on a year ago. Local Ammonium Nitrate prices have doubled in the last 12 months, and diesel prices have risen 60%, he said. 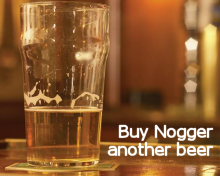 These guys are also going to find it very tough to fund the purchase of their inputs this year then it would seem. Whilst the global market isn't oblivious to these developments, its reaction is strangely subdued. The bears are pointing to economic slowdown in China, the alarming slump in crude oil prices, potentially record world soybean production (and ending stocks) this year, and fickle fund money getting out of commodities and saying that the worst isn't over yet. The ECB meanwhile announced no move on interest rates in the eurozone, and that they are to unleash more than EUR1 trillion in quantitative easing, pumping EUR60 a month into a bond-buying programme. The euro sunk to a new 7 year low of 1.32 against the pound following the news. 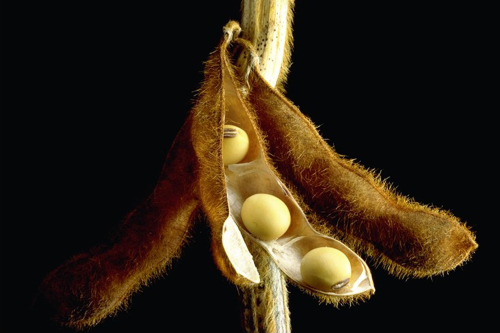 21/01/15 -- Soycomplex: Beans closed with small gains. China bought 176 TMT of US beans for 2014/15 delivery, despite having cancelled almost 500 TMT of similar purchases in recent days. 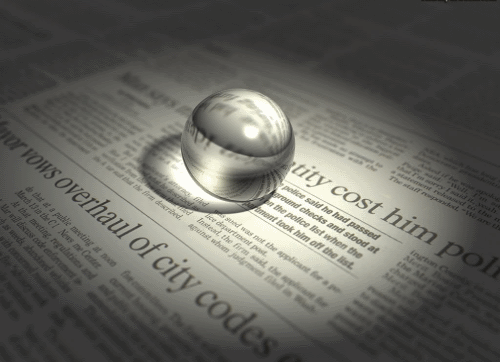 Now that the January WASDE and stocks reports are out of the way, fresh news is lacking. Celeres raised their forecast for the Brazilian 2014/15 soybean crop to a record 94.2 MMT. "Brazil soybeans have been subject to hot, dry weather in January, especially in the tropics, though the forecast is more hopeful for rain," said Martell Crop Projections. "Mato Grosso’s top soybean producing area, the centre-west, received only 40-55% of normal rainfall the past 30 days, while the centre-east was even drier with 35-40% of average rain. Much better rainfall close to average has developed in the southeast, though this area of the state produces fewer soybeans," they add. Mar 15 Soybeans closed at $9.83 1/2, up 1 1/2 cents; May 15 Soybeans closed at $9.89 1/2, up 1 3/4 cents; Mar 15 Soybean Meal closed at $330.50, up $4.00; Mar 15 Soybean Oil closed at 32.41, down 43 points. Corn: The corn market closed around a couple of cents lower. Ukraine said that they'd shipped 8.3 MMT of corn so far this season. The USDA have exports down at 16.5 MMT, which means that they are around halfway through their anticipated 2014/15 campaign total. "Reports have it (corn) trading out of Ukraine at $6-$10 MT discount to FOB US equivalent. It’s a bearish sign that the market feels comfortable enough to continue to book offers out of the Ukraine at (only) a slight discount to US origin corn," said Benson Quinn Commodities. Today's regular weekly ethanol production data from the US Energy Dept is delayed a day due to Monday's Martin Luther King Day holiday. The trade will be scrutinising that for any sign of a slowdown in demand for US corn. Last week's production was 978,000 barrels/day, up from 949,000 the previous week. Crude oil is off the recent multi-year lows, but not by much. Analysts at the World Economic Forum in Davos are now suddenly lining up to tell us it will be a long time before we see $100/barrel again. Mar 15 Corn closed at $3.88, down 2 1/4 cents; May 15 Corn closed at $3.95 3/4, down 2 cents. Wheat: The wheat market closed lower, with Chicago faring the best of the three. The market seems surprisingly relaxed about the developing situation in Russia and Ukraine. Rather than pushing through as much of their existing wheat contracts as possible in the last fortnight of January, before the new export duty comes in, the pace of Russian shipments out of the Black and Azov Sea hardly seems to have picked up at all. There are reports that all vessels loading grain for export now must have a phytosanitary official present to obtain the necessary customs clearance documentation. This is slowing loadings down considerably as the Feb 1 export duty introduction date nears. Rusagrotrans today cut their forecast for Russia's January grain exports from 1.5 MMT to 1.3 MMT. They were 3.15 MMT in December. The Russian government meanwhile have only very limited success in securing the kind of volumes of wheat they want for their state-owned stocks via their intervention purchase programme. Morgan Stanley forecast Russian inflation at 13.7% by the end of 2015, which will encourage growers to sit on their stocks even more. Mar 15 CBOT Wheat closed at $5.36 3/4, down 1/4 cent; Mar 15 KCBT Wheat closed at $5.72 1/4, down 5 1/2 cents; Mar 15 MGEX Wheat closed at $5.81, down 8 1/2 cents. 21/01/15 -- EU grains closed mostly higher, with reports of increased unrest in eastern Ukraine possibly causing a bit of short-covering and/or encouraging one or two specs back into the market. The pound was down against both the euro and the US dollar. The minutes from the Bank of England's January meeting showed a unanimous vote to keep interest rates on hold, and hinted at less willingness to consider a rise for some time yet. At the close, Jan 15 London wheat was up GBP0.55/tonne to GBP126.80/tonne; Mar 15 Paris wheat was up EUR1.25/tonne to EUR197.75/tonne; Mar 15 Paris corn was EUR0.25/tonne higher at EUR157.00/tonne; Feb 15 Paris rapeseed rose EUR0.25/tonne to EUR355.00/tonne. "A surge in violence in east Ukraine is undermining international hopes that Russia's financial crisis and Western sanctions will force President Vladimir Putin to change policy on the conflict," said a report on Reuters. There is "a growing sense of foreboding" as the as fighting between government forces and the separatists intensifies, they said. Rusagrotrans trimmed their forecast for Russian grain exports this month from 1.5 MMT to 1.3 MMT, a near 60% decline compared with those in December. Exports during the first half of the month were just 588 TMT, they noted. The Russian Ag Ministry estimated domestic grain consumption at 72.8 MMT this season, which is around 3 MMT higher than normal, presumably due to increased demand from the feed sector due to the ban on importing various Western food commodities. Russian wheat consumption this season will total 37.4 MMT, they said. That's 2.4 MMT higher than the USDA currently forecast. Morgan Stanley estimated Russian inflation at the end of 2015 to be running at 13.7%, which would be higher then the 11.4% that it finished 2014 at. It's also far higher than the Russian Ministry's own official forecast of 7.5%. Inflation continuing at those levels will not encourage Russian farmers to sell their grain. The government picked up a miserly less than 3,000 MT of grain at today's latest round of purchases for the intervention fund. Meanwhile, there's continued uncertainty over the health of winter sown crops in both Russia and Ukraine. At the risk of sounding like a broken record, there's also a huge question mark hanging over the ability of farmers in both countries to afford spring inputs. Russian lending to farmers is reported to be down 22% in rouble terms, despite the alarming devaluation of that currency meaning that it really should be far higher than year ago levels. In Ukraine, winter grains in the Donetsk region are said to be rated 37% good, 44% satisfactory and 17% weak/thinned - the latter figure being about in line with the national average of 18%. A year ago that figure was 8%. The Ukraine Ag Ministry said that they'd exported 20.77 MMT or grains so far this season, including 8.5 MMT of wheat, 8.3 MMT of corn and 3.75 MMT of barley. There's no sign yet of the memorandum due to be issued by the Ministry, detailing exactly what was agreed between them and Ukraine grain exporters at last week's meeting when an "informal" cap on wheat exports was mooted. 20/01/15 -- Soycomplex: Beans closed around 8-10 cents lower, helped on their way by news of another 174 TMT worth of Chinese cancellations. News that China posted the slowest economic growth in 24 years in 2014 didn't help either. China are of course the world's largest soybean buyer by some considerable distance, importing almost 6 times the volume that second placed Europe does, and accounting for almost two thirds of all international trade in beans. Chinese cancellations of US beans for the 2014/15 season are now almost 500,000 MT. "The combination of competitive South American offers, ample supplies, tight crush margins and some issues with financing can be given credited for the recent cancellations," said Benson Quinn's Brian Henry. He said that he could see China maybe cancelling a further 1 MMT of US purchases. Weekly US export inspections are still holding up though at 1.518 MMT this week, although some think that this could be the last week that we see this sort of volume as demand starts to switch to South America. The Rosario Grain Exchange lowered their forecast for the Argentine soybean crop by 0.5 MMT to 54.5 MMT, on the back of a lower planted area. Most of the crop is in good to very good condition however, they say. Mar 15 Soybeans closed at $9.82, down 9 3/4 cents; May 15 Soybeans closed at $9.87 3/4, down 9 3/4 cents; Mar 15 Soybean Meal closed at $326.50, up $0.30; Mar 15 Soybean Oil closed at 32.84, down 55 points. 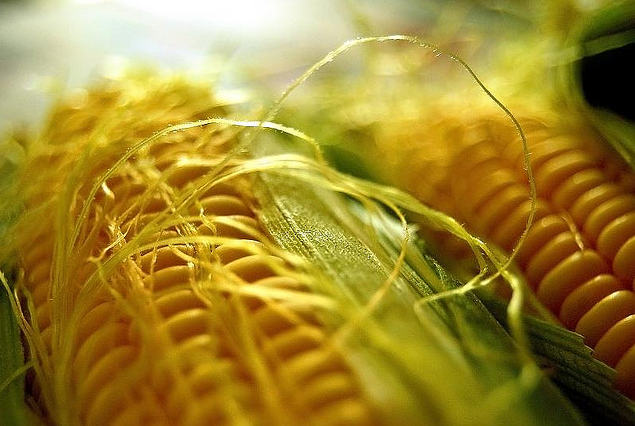 Corn: The corn market closed around 3 cents higher, helped by weekly export inspections of close to 750 TMT, which was towards the top end of trade anticipations. "Late in the session corn seemed to shrug off the bulk of the bearish news in the market concerning oilseeds, currencies, and crude," said Benson Quinn. US corn exports are now running at around 30% of the USDA target for the season, versus 35% typically at this time. Opportunities to ship US corn to China remain limited, although they are buying large volumes of US sorghum. Weekly sorghum export inspections were 9.2 million bushels, of which 8.5 million was for China. Last week's sorghum export inspections were only 4.8 million, and the five year average for this time is just 1.9 million. Sorghum exports are already 50% of the USDA target for the season versus just 21% a year ago and 38% for the 5-year average. Mar 15 Corn closed at $3.90 1/4, up 3 1/4 cents; May 15 Corn closed at $3.97 3/4, up 3 1/2 cents. Wheat: The wheat market closed a little firmer. Weekly export inspections were a little over 310 TMT, up 30% versus last week, although still far from impressive. US wheat continues to struggle to match more competitive offers from the likes of Europe, particularly into the North African/Middle East market. "Washington the 3rd largest US winter wheat state has received beneficial heavy rainfall recently. Waves of showers the past 2 weeks brought 1.6 inches of rainfall, 45% above normal. The wet weather pattern started in mid December. The wet weather pattern in the Pacific Northwest may reflect the weakening El Niño signal," said Martell Crop Projections. The market currently seems relatively relaxed about the situation in Russia and Ukraine, despite the fact that production problems there have sent the market soaring in two out of the last five years. Russia only managed to buy less than 7,000 MT of wheat at today's intervention purchase round, with total net purchases since Sept 30 at only 320 TMT. Mar 15 CBOT Wheat closed at $5.37, up 4 1/4 cents; Mar 15 KCBT Wheat closed at $5.77 3/4, up 3/4 cent; Mar 15 MGEX Wheat closed at $5.89 1/2, up 5 cents. 20/01/15 -- EU grains closed mixed. Despite US markets re-opening after yesterday's Martin Luther King Day holiday, trade remained relatively subdued. At the close, Jan 15 London wheat was up GBP0.45/tonne at GBP126.25/tonne, Mar 15 Paris wheat was EUR0.50/tonne higher at EUR196.50/tonne, Mar 15 Paris corn was EUR1.50/tonne lower at EUR156.25/tonne and Feb 15 Paris rapeseed was down EUR3.25/tonne at EUR354.75/tonne. Russia only managed to pick up around 7,000 MT of wheat at today's latest intervention purchase round. That takes the total bought so far this season to a relatively miserly 320 TMT out of a government target of at least 3 MMT, as growers continue to hold onto their stocks as a hedge against inflation and the falling rouble. There are now rumblings of the Russian government "withdrawing state support" from those farmers who continue to hoard their grain stocks. The Deputy Russian PM also said that further and "more radical proposals" could be introduced to curb wheat exports should the new Feb 1 duty prove to be not enough to curb foreign sales, and encourage growers to sell their stocks to the intervention fund. The latest customs data shows that Russia exported less than 600 TMT of grains in the first half of January, down sharply from around 1.5 MMT in the corresponding period in December. Whilst this can partly be attributed to adverse weather conditions and the extended Orthodox Christmas celebrations, certainly some of this slow down can also be blamed on difficulties in obtaining the necessary customs clearance. The combined effect of these new developments is likely to cap Russian wheat exports at around 18 MMT this season, which is around 4 MMT lower than original expectations. (The USDA themselves were forecasting Russian wheat exports of 22 MMT in 2014/15 as recently as December). 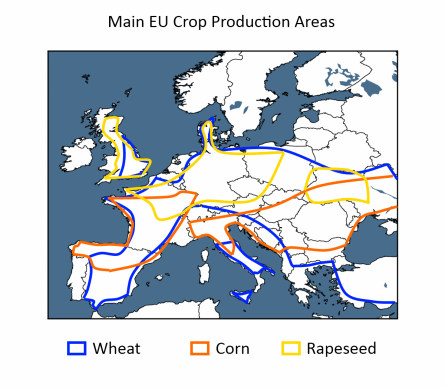 So this potentially leaves an extra 4 MMT of global wheat demand to switch to other origins, of which Europe is expected to pick up the lion’s share of the business. In other news, Kazakhstan said that their Jan 1 grains stocks were 13.15 MMT, of which 11 MMT was wheat. Ukraine said that growers there had planted 8 million hectares of winter grains, including 6.8 million ha of wheat. In addition they'd also planted almost 900k ha of winter OSR, said the Ag Ministry. Around 3% of winter grains haven't yet emerged, and 18% of what has emerged remains in a weak/thinned state. 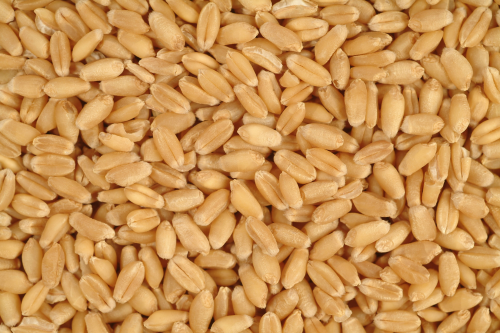 Jordan are tendering for 100,000 MT each of wheat and barley for Jun/Jul shipment. 20/01/15 -- There's not a lot to get your teeth into first thing this morning, the US overnight markets are waking up after yesterday's holiday, and are generally a little bit lower. Jordan are tendering for 100 TMT each of wheat and barley for Jun/Jul delivery. Kazakhstan say that their Jan 1 grain stocks were 13.15 MMT, including 11 MMT of wheat. The Russian Deputy PM has said that the government could introduce "more radical measures" than the recently unveiled export duty to curb foreign sales, should the current moves prove to be insufficient. Traders report that obtaining the necessary phytosanitary certificates to export Russian wheat is still a slow and labourious process, slowing exports just as shippers try to step these up ahead of the introduction of the Feb 1 export duty. The Russian Ministry have finalised their estimates for the 2014 grain harvest at 103.8 MMT, up from 92.4 MMT a year ago. That includes 59 MMT of wheat. 20 MMT of barley and more than 11 MMT of corn. Ukraine said that the winter grain planted area there was 8 million hectares, including 6.8 million ha of wheat and 1.1 million ha of barley. They've also planted a little under 900,000 ha of winter OSR. Emergence is 97% and winter crop conditions in Ukraine remain at 18% weak/thinned. Japan are in the market for 142,500 MT of wheat of US, Canadian and Australian origin in their regular weekly tender. The results are due Thursday. Pakistan said that they could export up to 3 MMT of their own surplus wheat stocks this year. If the rats haven't had them first that is. The Rosario Grain Exchange have lowered their forecast for the Argentine soybean crop by 0.5 MMT to 54.5 MMT, on the back of a lower planted area. Most of the crop is in good to very good condition, they say. And finally, some good news for my pet tortoise who's been waiting ages for a neck transplant. Anne Kirkbride died last night. Come on, 60 years old, my arse. She's been in Corrie longer than that. 19/01/15 -- With US markets closed for the Martin Luther King Day holiday this was never going to be a "Thriller in Manilla", more of a "Yawn in Benidorm" perhaps, and so it's proven to be so far in a day of quiet, low volume trade. At the close, Jan 15 London wheat was down GBP0.50/tonne at GBP125.80/tonne, Mar 15 Paris wheat was EUR1.50/tonne lower at EUR196.00/tonne, Mar 15 Paris corn was EUr1.25/tonne easier at EUR158.25/tonne and Feb 15 Paris rapeseed was up EUR1.00/tonne to EUR358.00/tonne. Fresh news was predictably light. Egypt's Supplies Ministry said that it had enough wheat now bought to last it through to mid-May, which is well after their own local harvest begins. That said, these sorts of announcements are routine and don't rule them out of re-entering the market again soon, especially if prices dip further. Last week's latest GASC tender purchased wheat for the end of February, which suggests that they will probably be back to buy Mar 1-10 shipment in the not too distant future. They're reported to have bought a fraction over 3 MMT of wheat on the international market for 2014/15 shipment so far this season, which is around 1 MMT less than they'd purchased this time a year ago. For the whole of last season they finished up buying 5.46 MMT of wheat on the international market, so even if they were to end 2014/15 buying a million tonnes (or even more) less than they did then, there's probably still a fair bit of interest to come from them before the season ends. French wheat would remain the red-hot favourite to pick up the majority of that business. Russia said that they'd exported 588 TMT of grains in the first 15 days of the month. That's only around a third of the 1.718 MMT exported in the first 17 days of December. Exports would therefore seem to have slowed up sharply. Although adverse weather conditions can be blamed for at least some of this decline, it's an interesting statistic nonetheless, given that shippers are supposed to be trying to rush through existing commitments before the Feb 1 export duty kicks in. Wheat accounts for 495 TMT, or 84% of the total shipped out this month so far. Russia's 2014/15 season to date grain exports are now 21.571 MMT, a rise of 31.6% on a year ago. Wheat accounts for 16.852 MMT of that volume, or 78% of the total. Barley adds a further 3.26 MMT and corn an additional 1.183 MMT. Looking ahead, "wheat prospects in Europe (for the 2015 harvest) are not as favourable as last season. This is likely due to unseasonably warm temperatures in the autumn growing season. September-November temperatures were 2-4 C (4-7 F) above normal, encouraging high evaporation and sapping field moisture," suggest Martell Crop Projections. "Mid-November satellite images reveal sub-par vegetative health in all 3 of the top wheat producing countries of France, Germany and the United Kingdom, compared to last year," they say. 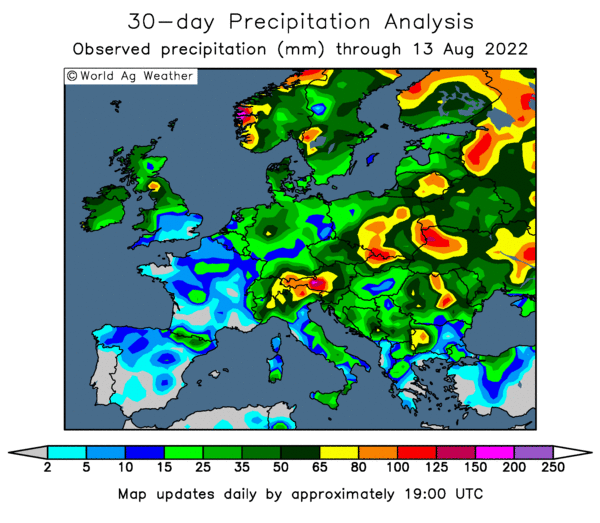 Topsoil moisture has increased sharply with heavy rainfall in northern Europe in the last 30 days however, they note. 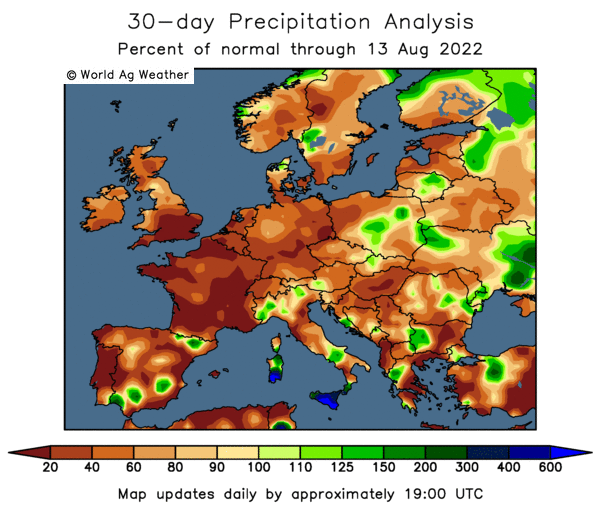 Conversely, countries in south eastern Europe like Hungary, Romania and Bulgaria have turned drier after widespread flooding in the autumn, they add. In other news, India said that it had planted 30.4 million hectares of wheat for the 2015 harvest, which is around 1 million less than a year ago at this time.